La comunità di Marialya in Coimbatore - che abbiamo visitato in giugno 2016 - e' una delle comunità che le suore dell'ordine Salesiano di Maria Ausiliatrice hanno in Tamil Nadu. La comunità ospita circa 80-90 tra bambine e ragazze orfane o provenineti da famiglie fortemente disagiate, che vengono affidate alle suore dopo essere state tolte alle famiglie dalle autorità governative per motivi di sicurezza e incolumità per le ragazze stesse. Nella comunità le bambine ricevono assitenza materiale e psicologica e possono frequentare la scuola. Le bambine ospitate sono in prevalenza di religione Indu, che è la religione di gran lunga prevalente (circa 97% della popolazione locale). La diversità di religione tra le suore della comunità cattolica le ragazze ospitate non e' mai stato un problema. In India la spiritualità e' perlopiu' percepita come bene comune, di valore superiore, del quale le (tante) diverse religioni presenti in India non sono altro che diverse declinazioni, tutte ugualmente degne del medesimo rispetto. Di seguito riportiamo in forma originale la lettera di presentazione della comunità Marialaya di Coimbatore, Dal 2015 detta comunità e' stata inclusa, insieme a quella di Dharmapuri, tra quelle con cui LaGioiaDiVivere ONLUS opera a sostegno dello sviluppo. Il contributo di cui al progetto qui descritto va per la costruzione di una nuova cucina in sostituzione di quella attuale costituita da un angolo all'aperto , sotto una tettoia di lamiera ondulata. Marialaya is a Salesian Institution working for the welfare and rehabilitation of Street girl Children. It was found and managed by the Salesian Sisters of Don Bosco. It was initially started in Madras in the year 1991 with the sole aim of rehabilitating the street girls, who were found working and living in streets. 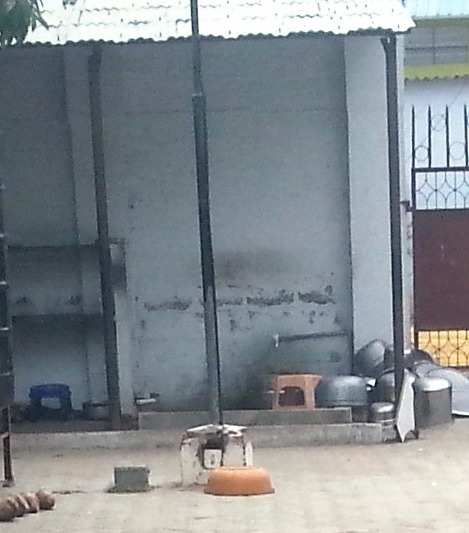 Seeing this plight in the city of Coimbatore a shelter home was opened in Coimbatore in the year 1996. Marialaya runs a shelter home for street girls between the age of 5 and 18. The girls above don’t favour to follow academic studies instead they opt for non-formal education. Coimbatore is the second largest city in Tamil Nadu. First the city is nick named as Manchester of South India. It is famous for cotton and engineering goods industries in the whole of South India. The rapid growth of industries is due to the thousands of ancillary industrial goods manufacturing units and other small-scale industries in various forms. It is one of the great marketing centers. There are around 135 large and medium industries and over 17,000 small supporting units. The city also is called as the “Detroit of South” manufacturing a variety of electrical motors and the other engineering goods. Child labour in Coimbatore is predominantly in the field of construction works, hotels and eating places, workshops, small industrial establishments, cart pullers and domestic household works, etc. “Marialya” with its vast experience working with street and working children takes up this challenge, and is very confident in achieving the results as expected, hence decided to evolve this programme is implemented would slowly and gradually change the life’s of these unfortunate children, which will enlighten them. It is as been a longstanding idea of Marialaya to have day care centers as well as supportive Educational Classes in the evening. The following services are existing with its valuable presence. Marialaya runs Evening coaching classes, towards girl children, drop outs, children who do not have a proper shelter and good support to continue their education. Among which the evening tuition functions well and aims at bringing holistic development in the lives of children and their parents. There are 20 centers with 509 children being benefited and excel in their curricular and extracurricular activities. children are undernourished and not sent to school. The girls who have passed school final exams are not sent for higher studies. They go for daily wages. They get married at age of 14 or 15 and become mothers in a very tender age. At present there are 61 children are benefited by our spiritual, moral and financial support. Among them 19 are total orphan children and the rest of them are semi orphans. Only few children have their parents separated and they live an immoral life. The Women self help groups were started in the year 2001 in Madhukkarai, Ganapathy, and SS Kulam areas with a vision to empower Women for their economical development and to bring out their inborn talents and skills, to create awareness about their rights and make them recognized individuals in the society. As the years past the interest of the women declined and now there are 80 groups with 956 members functions more committed and united with one another and with the organization. CHILDLINE 1098 service is a 24 hour free emergency phone outreach service for children in need of care and protection. Marialaya ensures the child’s safety, health care, Counselling and healthy atmosphere to grow in consciousness and understand ones crime and change for a better citizen. The children are looked after with utmost care and concern. They are followed individually and supported with moral education and educate them to read and write. At the time of sickness they are taken to Government Hospital for better treatment. As an entertainment they are shown documentary movies and films. All the basic needs are fulfilled with attentive care. The empowerment of rural women is seen as the only means of poverty eradication. Any economic step of empowering of these poor women will make provision to link the nature of empowerment with the skill training required for efficiently running it. The results of our vocational training show that the women are empowered to earn and sustain the family and look positively towards income generation program. In the beginning the number of women was many and now there are few who come forward to learn. 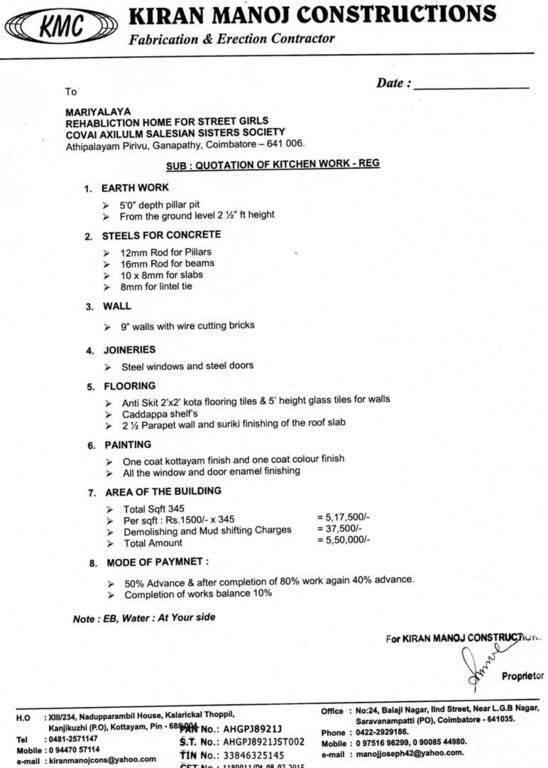 The above mentioned are the services accomplished by the salesian Sisters at Coimbatore, in the name of Marialaya Rehabilitation Home for street children. The women self help group members are active and they conduct, train and participate in various training programmes and celebrations. 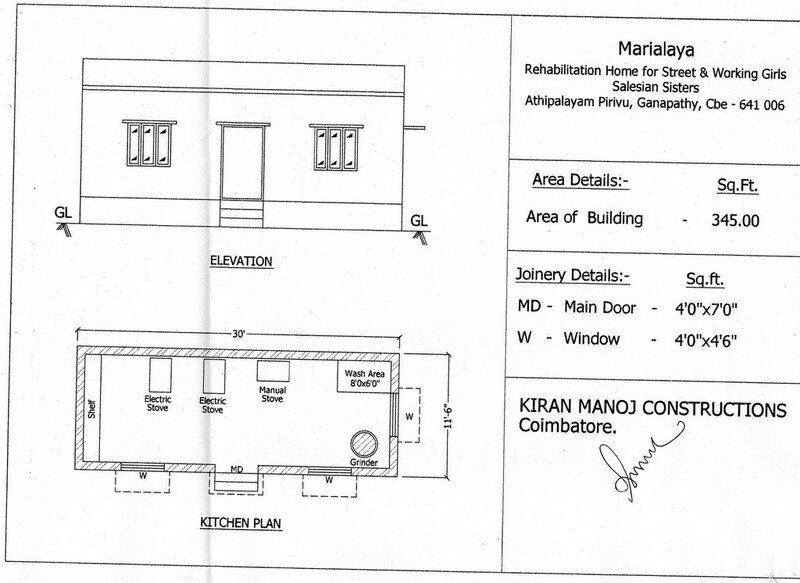 MARIALAYA - Rehabilitation Home for Street Children and Working Girls. Our mission is to “Foster hope for vulnerable children especially street migrant children, women in crisis and migrant families; so that they become socially and politically contributing through education, capacity building, livelihood and right based intervention”. Empowering women belonging to depressed section through entrepreneurship and other self employment income generation initiative is the prime objective of Women organization. We focus on the development of the socioeconomic status of Women and Children and eradication of child labour. We provide awareness program on women rights, Women self employment, Women leadership activities and Women health and hygiene. We have helped in organizing 80 Women Self help groups, each Women self help group has 12 -15 members and we created linkage with banks and helped the Women self help groups to utilize the developmental schemes for starting income generative programmes. We provide job oriented training, vocational training and skill training to the Women groups. We emphasize on both physical and mental health and hygiene of Women and provide individual counseling, group counseling and family counseling. We provide personality development trainings to Women and Children. We indentify the local, social issues and fight for the development, injustice done to Women and Children. We protect, promote and rehabilitate the shelter children by meeting their basic needs such as food, clothing, counseling, education, health and recreation. We admit the children at risk and accommodate them. We provide the basic needs like food, clothing, health care and education like Bridge course, Non Formal education, enrolment and regular Schooling. We have taken efforts to eradicate the problem of child labour, child trafficking, child abuse through campaign and awareness program and helped those children to get their rights and justice. We provide Non-Formal Education-Kovai class, Evening Study Center for children in very rural areas, bridge course for girl children. We organize motivation camps and medical camps for Women and children.